During the April 5, 2007, Deputy’s Advisory Working Group (DAWG) meeting. the DepSecDef directed completion of a capability based analysis (CBA) based on the Homeland Defense/Civil Support (HD/CS) Defense Planning Scenarios. The emphasis of this CBA will be on identification of gaps within the HD/CS mission which only DOD can supply. 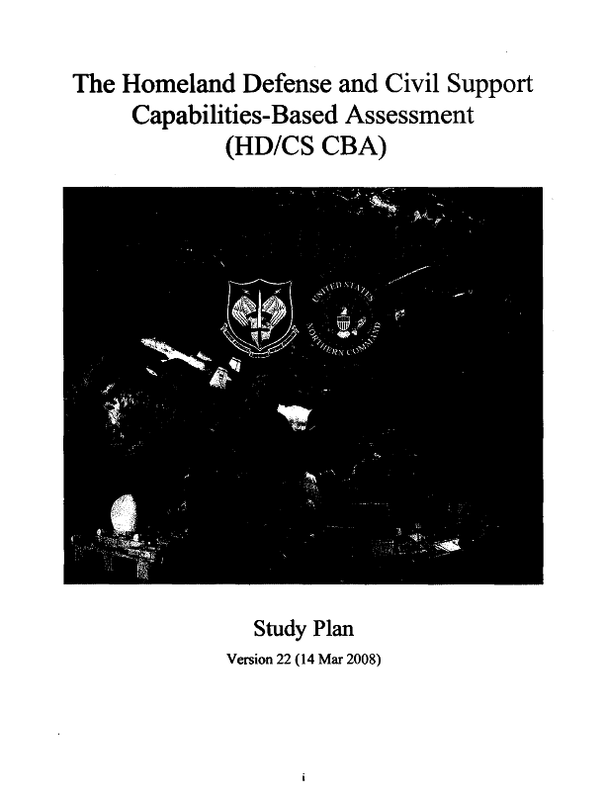 On May 30, 2007, a memo from the Assistant Secretary of Defense for Homeland Defense and Amaicas’ Security Affairs (ASD/HD&ASA) requested the NORAD-USNORTHCOM Commander lead this HD/CS CBA. Finally, the DepSecDef’s August 7, 2007, brief to President of the United States identified the HD/CS CBA as one of DOD’s top 25 Transformational Priorities with an objective of advancing to a major milestone by Dec 08. For the HD/CS CBA, submission of the Joint Capabilities Document (JCD) to the JROC for approval is this major milestone. The objective of this HD/CS CBA is to assess DOD’s ability to conduct HD and support CS missions across air, space, maritime, land, and cyber domains while simultaneously achieving MA objectives. While the HD/CS Joint Operating Concept (JOC) is the primary document describing how DOD will operate to achieve national unity of effort, this CBA will assist in identifying, and prioritizing, the capabilities which DOD will provide to defend the homeland and provide support to the lead federal agency for civil support. The HD/CS CBA focuses on military problems facing DOD in the 2012-2025 timefiame with an emphasis on 2014-2016, i.e., “how” DOD will fulfill its responsibilities required to lead, support and enable HD/CS missions. The HD/CS CBA will leverage previous and ongoing Service. Combatant Command, Agency, and Interagency analytical efforts to the maximum extent possible to prevent duplicative efforts and help define required HD/CS tasks, capabilities, capability gaps, and potential trade space. Significant collaboration with Interagency stakeholders is essential to the success of the CBA. Finally, this paper puts forward three scenarios for use in the HD/CS CBA analysis. These scenarios provide the conditions against which the HD/CS capabilities will be measured in the CBA and help define the capabilities needed for HD/CS. The scenarios are drawn from the National Planning Scenarios (NPSs), the Defense Planning Scenario (DPS), and the Steady State Security Posture scenarios (SSSPs ). In addition, other key Analytic Agenda efforts to include the CS Analytic Baseline (CSAB) and the HD Multi-Service Force Deployment (MSFD) studies will also be considered in the analysis as much as practical to help ensure consistency. 3.1. Establish assumptions, informed by interagency partners, on DOD and interagency roles and responsibilities for HD/CS missions and mission assurance function. 3.2. Through a cascading mission-to-capability, capability-to-task, task-to-characteristic, characteristic-to-attribute linkage, determine the core capabilities required to execute DOD’s HD/CS missions and mission assurance functions (CJCSI 3170.01F). 3.3. Systematically and comprehensively identify, integrate, and assess existing and planned HD, CS, and MA capabilities for the specified timeframe. As a key facet of this determination, in conjunction with Department of Homeland Security (DHS), identify current interagency HD/CS capabilities. 3.4. Identify and prioritize critical HD, CS, and MA capability gaps, overlaps, and redundancies while considering and characterizing mission risk. 3.S. Conduct a risk assessment and recommend a prioritized plan for future DOD HD, CS, and MA capability development which effectively leverages interagency investment. 3.6. Deliver a Joint Capabilities Document (JCD) with a prioritized list of HD, CS, and MA capability gaps. 4.1.1. Certain nation-states pursuing traditional, but constantly improving, capabilities including manned or unmanned systems (air, ground and maritime), kinetic weapons, ballistic and cruise missiles. 4.1.2. Emerging threats presenting greater challenges through an increased use of asymmetric approaches which avoid US strengths and attack US vulnerabilities in lieu of more traditional military means and methods. 4.1.3. Globalization creating opportunities for economic growth and an impetus for expanding political freedoms, but also accelerating corruption, the spread of disease, WMD technology, extremist ideologies, and terrorism. 4.1.4. Terrorism and terror tactics which are increasingly lethal, unpredictable, a-edible, well-organized, and well-financed. 4.1.5. Kinetic and non-kinetic attacks on information, Supervisory Control and Data Acquisition (SCAD A) and space systems. 4.1.6. Increase in the speed and scale of the proliferation of missile technology and the spread of chemical, biological, radiological, nuclear and high-yield explosive (CBRNE) weapons and their means of delivery, posing a fast-growing challenge to land, maritime, air, cyber, and space capabilities in the homeland and abroad. 4.1. 7. Requirements for unified action across DOD, USG Interagency, InterGovernmental organizations (IGO), non-governmental organization (NGO) and multinational partners. 4.1.8. Reassessment of DOD capabilities in domestic situations, specifically for the use of U.S. Coast Guard in Title 14 status and the National Guard in Title 32 Slatus. within the roles of disaster response and border control support. 4.2. The Homeland is confronted with a wide spectrum of threats ranging from traditional national security threats (ballistic missile attack) to law enforcement threats (drug smuggling). Between the two ends of this spectrum, there is a set of missions where an overlap of roles, responsibilities, authorities and capabilities exist amongst DOD, Department of Homeland Security (DHS), Department Health and Human Services (DHHS), Department of Justice (DOJ), and other Interagency (IA) stakeholders in securing the United States (US). These areas of overlap present an opportunity to take advantage of increased US Government capacity, and should not be viewed as detrimental. In order to take advantage of these areas of overlap, it is vital that appropriate interagency pre-event planning occur and that stakeholders come together in a “unity of effort” through operational coordination and collaboration during the threat response. Noting the importance of this need for “unity of effort,” the President has directed specific coordination requirements in the Maritime Operational Threat Response (MOTR) Plan and the Aviation Operational Threat Response (AOTR) Plan, as well in other planning and operational documents. While the HD/CS Joint Operating Concept is the primary document describing how DOD will operate to achieve National unity of effort, this CBA will assist in identifying, and prioritizing the capabilities which DOD will use to contribute to the Nation’s security activities. 4.3. In parallel with the Homeland Defense mission, DOD must remain prepared to support its Federal, State, and local partners in responding to natural and manmade disasters or accidents when directed. Natural disasters such as major hurricanes, earthquakes, or pandemics can overwhelm local responders and involve significant allocation of defense resources to help mitigate the effects and support relief and recovery efforts. Likewise, a successful terrorist attack, particularly one involving WMD, can cause catastrophic losses requiring substantial Defense Support of Civil Authorities (DSCA). DOD must be trained, equipped. and ready to provide the capabilities needed to assist civil authorities when required. 4.4. Finally, DOD must sustain the nation’s freedom of action during and despite any of the events described above. This effort includes Emergency Preparedness, Defense Critical Infrastructure Protection, Continuity of Government and Continuity of Operations as well as ensuring and assessing the protection of the Defense Industrial Base.